(Newser) – Russia hasn't seemed much interested in lowering tensions ahead of tomorrow's secession vote in Crimea, and today's actions reinforce the point. The Washington Post reports that Russian forces have seized the small village of Strilkove in Ukraine territory near Crimea, along with a gas-distribution station either in or near the village. So does this qualify as an invasion of Ukraine, which Russia had promised wouldn't happen? Ukraine certainly thinks so, reports AP, with its foreign ministry declaring that it "reserves the right to use all necessary measures to stop the military invasion by Russia." Russia never promised not to move military forces inside Ukraine. They got Duma authorization and request from the legal president. They say, currently there are no Russian troops in Ukraine. A Russian official said the military took action to save the gas facility from "terrorist attacks," Looks like they borrowed a line from the USA playbook. What a bunch of liars! Ukraine does not have a legal government. One installed by the US doesn't mean anything. It only divides the country and pushing it closer to civil war! How about reporting 2 murders in Harkov by members of Right Sector? 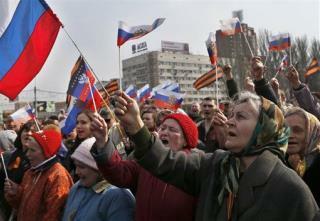 How about reporting 30.000 people rally in Moscow in support of Krim joining Russia? How about all pro-Ukraine rallies all over the country? Western sources are bunch of biased hypocrites.